Moving with kids to a new home can be an exciting and stressful time for the whole family. 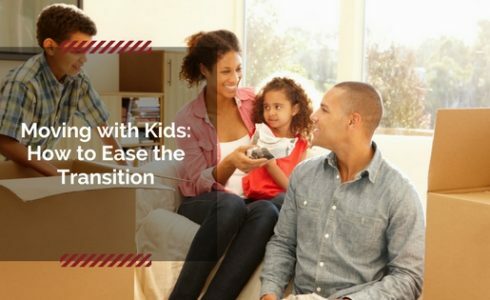 Thankfully kids are pretty resilient and adaptable so they’ll bounce back, but there are things you can do to help ease the stress of this major transition. You can never predict how your kids will react to moving but it’s definitely something you should be talking to them about. Give them the opportunity to express any fears, uncertainties or anxieties they may be feeling about the impending move and help them to process their feelings. There may be some tears or tantrums (and that’s normal). This is also a great time to discuss the move and what they can expect to happen as the family prepares to leave their current house. You can frame it as an adventure or other fun way to keep the kids engaged and pique their interest. Depending on the age of your children, you may want to do most of the packing while they are asleep so you don’t have curious toddlers undoing the hours of work. If you’re children are older, allow them to help by packing up their rooms. You may need to go back and repack their work, but this will give them the feeling of a little bit of control. Likewise, if you’ll be donating items, consider decluttering things while younger children are asleep and make sure to get rid of the evidence before they find it. You’ll be surprised how the toy they haven’t touched in months is now suddenly their favorite. Older kids can be tasked with parsing through their belongings and deciding which to keep or donate/toss. A great way to get children excited for a new home is allowing them to plan how their new room will look. You can let kids choose paint colors or other fun, smaller items like inexpensive wall decals, new bedding or other accessories to make their new room uniquely theirs. Moving day is hectic alone so save yourself some stress and, if possible, arrange for childcare for any younger children who may get lost in the hustle and bustle of the move. This will allow you to focus on the final moving tasks without needing to heard little children. Once the boxes have been picked up and the house is empty, take one final walk through the house so everyone can say their goodbyes. One of the best ways to help a child transition into their new home is to set up their rooms first so they have something that looks familiar. Moving with kids can be emotionally taxing, even if you’re moving just a few blocks away. But these tips will help make this transition a little bit more manageable for every family member.